Using stroller tips can make your vacation comfortable at an outdoor or park like Disney World. Disney World can be a good choice for any parents to spend their vacation. Kids enjoy most at Disney world. If it is your first time at Disney with your kid then there are some tips for using a stroller at Disney World. These tips will help to make your vacation more comfortable and you will enjoy the most. 1 Why You Really Follow Using Stroller Tips At Disney World? Why You Really Follow Using Stroller Tips At Disney World? You will get various opinions about the utility of the stroller at Disney world. And obviously, these options are too much conflicting. If it is your first time at Disney World with your kids then definitely it difficult to decide carry stroller or not. Another problem is that you have no idea about your kid’s performance at such a gigantic size of the area. A stroller can be the best place to take rest for your baby. A safe place to sit or sleep. The stroller also can be a great transport to visit the whole park end to end. Choose the best stroller for Disney world which may make your move easy. Some necessary goods like a diaper bag, extra dresses for baby can easily store at stroller basket. In my opinion, the best thing about taking the stroller with you is to protect your baby from the unfriendly weather. At the time of rain or extreme heat of the sun, you can easily protect your baby by using it. If you do not take the stroller to Disney Wired, you might have to pay some money to rent. Another problem with rental is you may not get all comfort from it. So, if you have a good one then why should you waste money on an uncomfortable vehicle? The vital reason for taking the stroller with you is the use of baby’s nap time. Many parents have to return to the hotel only because the baby needs rest. You will get some quiet corner in many parts of the park to sleep your baby. Then why should you take hustle to leave the park, just take your stroller and enjoy the full time? As we already said, you may have wasted money by renting a stroller. Especially if you plan more than one or two days spend in the park then you have to expense $15 to $25 every day. The main thing is that bringing your won stroller not only make comfort your vacation but also save your wallet. Many kinds of transport can refuse to carry your stroller due to lack of enough space. But for easy movement at Disney world, the stroller is the must. So how can you solve this problem? Why don’t you find the available flight toward Disney world? Yes, you will available flight from many destinations to Disney world. Search for the suitable one for you has a nice journey with your own stroller. Make sure before fly that the airline carries a stroller or not. Most of the airline allows car seat, stroller, and infant carrying seat. You may have to undergo some security procedure but don’t worry these are only for other’s safety. Sometimes it is hard to fit a stroller in the transport. Besides this, many public types of transport do not allow to carry a stroller. As we know that the average size of the stroller is 36’’*52’’ and it is quite a difficult set into the available vehicles. The only solution to this problem is rent a stroller. The rental strollers of Disney world are looking something like jogging stroller but don’t worry it will purely suitable for you. We have already mentioned that you expend about $15 to $25 every day for the rental vehicle. Another option is to buy a stroller. You will get the vehicles at the same place where the rental is located. These strollers can carry about 40 to 50 pounds easily. It may cost about $60. If you have a plan to spend time more than one or two days at Disney world then buy it is the better idea than rental one. You will find a large number of similar strollers in the park. Especially when you leave it in the specific parking area. It may become a big challenge to you to find out your one among the hundreds of others. The easy way to find your vehicle tags something like colorful small flag, balloon, ribbon or leave a sing for marking as yours. Disney world is full of the attractive part of Fantasyland, Toon Town, Tomorrowland, Frontierland etc. You can’t carry a stroller everywhere. The perfect solution is to park your vehicle in the specific parking area and then enjoy. As you can’t constantly move with and without a stroller, you should find out the place where you can park it and easy to find at the time of back. Remember one thing that parks your vehicle only at dedicated parking area which is selected by the administrative authority of Disney world. If you leave the stroller at any undesired place like beside of garbage can or in front of sitting place then the possibility is don’t see it where you left after return. Authority will move it to the right place because it may disturb other visitors of the park. But don’t worry dear visitor, you will get the dedicated parking area nearby every attractive part of the park. Just park the stroller and enjoy your vacation. Disney world is a place where you will get a sea of the crowd at every part. Hope you imagine that moving with stroller how much difficult through crowds. You should keep hard patience and walk slowly along with crowds of people. Be careful not to hurt others back or to the ankle. Don’t try to overtake whose are moving slowly in front of you. Otherwise, there can be a conflict. You should behave with other guests very friendly. Some extra accessories of stroller may make your vacation more comfortable. Use shade on the stroller, because it will give you extra protection at the time when you take a break. You will get an excellent Disney experience. But in my opinion, it is better for the children to get a stroller used at home without taking a stroller from the Disney World. This will make the kids feel more comfortable. If you have an infant then my suggestion is to use a full set stroller. It will protect your baby form over sunshine and raindrops. You can take an extra snack tray and obviously a safety harness. These accessories will make your vacation not only comfortable but also safe. 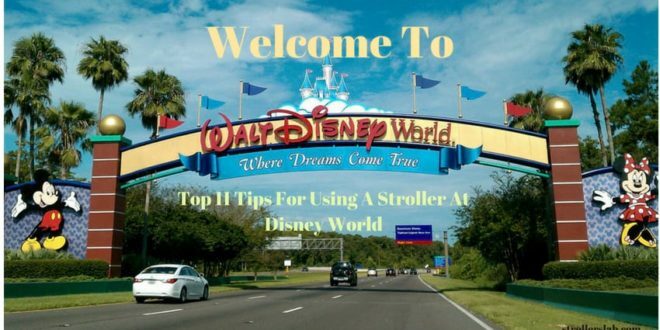 Now I’m going to give you the best tips for using a stroller at Disney World. And the tips are ‘take a rain cover with you’. You can’t take chance with your baby’s safety, isn’t it? You can’t predict about rain especially in summer. So why should you take a risk? The cover must be as stroller size. Make sure that there are enough ventilation paths otherwise baby can feel suffocation. Try to choose multifunctional cover which may protect your baby not only from rain but also from snow and fog. Some pediatrician said that stroller may become extremely hot that can make easily sick a baby. So you should be very conscious of sun heat. Sometimes a parent becomes relax by taking the stroller with the largest canopy. But you know, the canopy is not sufficient to prevent heat, especially in the summer sun. So, now take another best tips for using a stroller at Disney World and that is taking a breathable stroller cover. You should avoid blanket. If you are really serious about breathable stroller cover then you can try SnoozeShade Plus. You should very conscious about heart attack to your baby. Keep checking after a few minutes. If your baby’s skin feels hot to touch and become radish, looking tired, over sweating then take all these as warning signs. Don’t waste times at all, as soon as possible consult with a doctor. Move your baby to a comparative cool place quickly. Several policies have been recommended for the safety of Disney World. This policy applies to everyone regardless of small ones. There are some instructions for using the own stroller. It is compulsory to comply with these instructions. Let’s learn about the principles of the stroller. Any trailer-like object that is pushed or towed by an Electronic Convenience Vehicle, wheelchair or stroller, or pulled by a person or wagons. You must follow the park rules of Disney World for your safe journey. Finally, as we know Disney World is a crowded place, as a result, it becomes quite difficult to take a stroller. Here I have discussed possible all obstacle against use stroller in Disney world and their solution also. So try to follow these using stroller tips at Disney World and enjoy a happy vacation.